Jon Favreau’s Iron Man takes super hero movies to the next level. 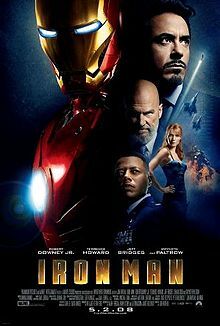 Starring Robert Downey Jr., Gwyneth Paltrow, Shaun Toub, Terrence Howard, and Jeff Bridges this movie is action packed and full of excitement. This film has a very exciting plot. This movie is full of suspense, action, and special effects. The actors in the movie portray their characters beautifully; they make their characters very believable and interesting. Robert Downey Jr. is my favorite actor in this movie; he makes Tony Stark a witty, intelligent, and charismatic character. This movie has superior action scenes that include pyrotechnics, and computer design. The clarity of the scenes amazes me. Even though the audience knows some of the scenes portrayed could never actually happen, it looks very realistic. The scenes with fire and pyrotechnics are very impressive. This movie does a good job at controlling everything going on and making it seem real. As for costume and design, the clothes in this movie fit modern society very well. I suggest this movie for lovers of action, and people old enough to understand a plot that is slightly confusing but great. I would definitely pay to see this movie.